Santa Anita Park will proudly host an equine baby shower in honor of the great Zenyatta’s newly arrived foal this Saturday, March 17. 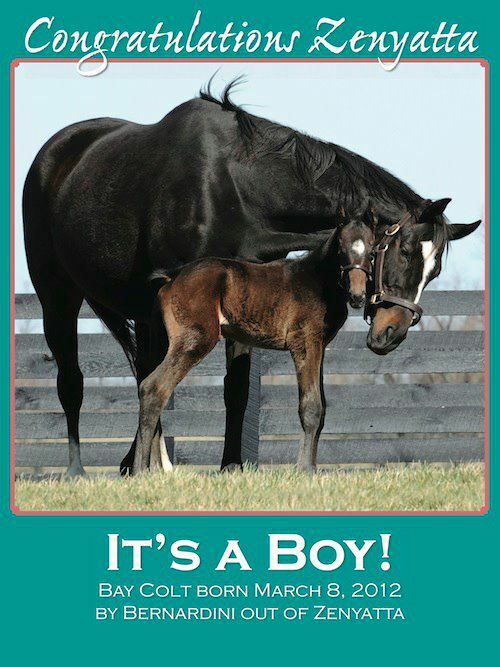 All on-track attendees will receive one “It’s a Boy” poster, free with their paid admission and will have an opportunity to meet “Team Zenyatta” in an autograph session prior to the races. “The entire racing world is buzzing about Zenyatta’s new colt, who was born in Kentucky last Thursday night (March 8),” said Chris Quinn, Santa Anita’s Vice President of Sales and Marketing. “Zenyatta is easily the most popular horse of the past 25 to 30 years and people are clamoring to see and learn more about her new baby. “The Queen’s Dance,” a life-size painting of Zenyatta on post parade, will also be on display at Santa Anita on Saturday. This magnificent work of art, first unveiled during Breeders’ Cup week this past November at Churchill Downs, was created by Jaime Corum (whose posters and original artwork will be available at the gift shop this weekend). Corum, along with members of the Zenyatta team, will be on hand Saturday and will participate in the Zenyatta autograph session which will take place from 11:15 a.m. to 12:30 p.m. in Santa Anita’s East Paddock Gardens area. Several charities, including CANTER of California Old Friends, Race for Education and EAGALA, which have been involved with Zenyatta throughout her legendary racing and now maternal career, will be represented at Saturday’s event. First post time on Saturday is 12:30 p.m., with the Grade I Santa Margarita Stakes (won by Zenyatta in 2010) and the Irish Obrien Stakes headlining a festive St. Patrick’s Day card. I’m so happy your morning has gone better than anticipated. Zenyatta has tremendous healing powers. I hope your afternoon classes go well, too. It sounds like the children are real little troopers. Bless you all. Marty R.
Dear Shari, I’m glad to hear our prayers were answered. Thank you for giving us the update on your day. Mistletoe is a darling too. Just ask Zenny….she will give you pointers..
Come on Tasty, I know you can do it. I think it would be a shame if you and Zenyatta could not be paddock pals with your foals. That would be to cute! I’m going to try a little attempt at humor. I’m an above average sized human female ( don’t really know if that has anything to do with anything). My only baby was born two weeks to the day past the due date. He weighed 9lb 1/2oz, was 21 inches long and needed a manicure. He was born with a scab on his earlobe from scratching himself with his looong fingernails. So I’m wondering if a farrier should be in attendance when Tasty foals in case 12TT needs a little hoof trim at birth. Groans are okay, I don’t mind. Just getting a little nervous for Tasty. I just hope Tasty’s foal isn’t getting too big anywhere that matters! On the interview that Bloodhorse did last week with the Lane’s End staff, they already said that they were looking for a couple of new buddies for Zenny and foal so it already sounded like Z and Tasty will not be together (groan). I had heard that in the interview. Maybe it’s kind of a fault of applying human feelings to horses that makes me unhappy for their being separated. And I know Zenyatta makes friends easily. She has such a presence about her, that I think other horses give her respect or something like that. Who knows, maybe Tasty and Life is Sweet will foal close together and they can be paddock buddies. There I go again. I just want happy mommies and babies. Thank you for your e-mail address. I will write shortly. The husband wants lunch now. LOL When you see a message from macrich…..that will be me. I was unable to donate to any of the equine charities, But I was able to get a few extra “I’ts a Boy” posters. I am offering one to each of you because I seen your posts and that you did donate and missed out on poster. My email address is: ryount6@yahoo.com. Send me an email with your address and I should be able to mail one to each of you. I am going to figure how much to buy tube and mail. Hopefully will not be to much. It is not signed. They were only signing one each so they would not end up on EBAY!! P.S. JAG, I walked around and they had stacks of them so I picked up a few more just for this reason. I just e-mailed you. Thank you for this offer. Marty R.
Raylene, I sent you an email as well. Too cool! I just checked the foal’s list and still no Tasty. Any update somewhere? I am starting to worry. I love you Tasty. I hope everything is ok with her. Tomorrow is the spring equinox. I am hoping that it will work its magic on Tasty. I am worried about her to the max. Hi Z’sters, I am late to the party today. I was not late to the shower. I met up with JAG and she introduced me to a lot of the dumplings. I am sorry I do not remember all of your names, but it was great to meet all of you. I am with everyone else who braved the storm. The parking lot was like a lake and almost had to swim to get there. Once I did get there they had moved it inside thank goodness or there would have been some soggy dumplings. Even tho most of did get soggy just trying to get in there. It was great to see Dottie and John Also, Mikie! and I did personally thank her for the wonderful job on the diary. I told her I was new and even in the month I have read it I have enjoyed it immensely and really enjoyed meeting new friends. We all took pictures so hopefully one of us can post them. I know someone took video also. the life size painting of Queen Z was beautiful. They would not let us take pictures with it. That was what I wanted to do. Besides the weather, It was very nice and not nearly the crowd that was expected. I think the storm scared everyone away Except for us Die-Hard Queen Z fans!! Sorry my writing skills are not the best, But I would not miss out on posting with all of you. So glad you had such a great time Raylene. Hi everyone……haven’t posted for a day or so as have been under the weather. So nice to read everyone’s stories about the poster signing. Almost made me feel like I was there! I can’t believe Tasty STILL hasn’t foaled! I agree with some of your earlier posts — let her have a good ROLL IN THE MUD! It worked for Zennie!!!! Hope to see some new photos of THE PRINCE soon! I went to Z’s baby shower, drove in the DOWN POURING RAIN but it was so worth it! I saw the life size painting there are no words to describe it! BEAUTIFUL!!!! I got two posters signed by Jamie, John and Mike, Dottie was busy speaking with someone. I have 6 posters that are not signed, I would be willing to mail them to any Z Dumpling the only thing would be is that you pay for the shipping. I stood in line for 45 minutes to get the posters sing, but it was so much fun speaking with the Z fans! I wore my sweat shirt with Zenyatta’s name across the front and it also say 2010 HORSE of the YEAR on it as well. So many people asked where did you get your sweat shirt! I purchased it on breederscup.com. Check it out it is really very nice. THANK YOU LANES END FOR KEEPING THE WEB SITE UP! LOVE YOU FOREVER AND EVER ZENYATTA AND PRINCE! Hi Robin – I would love one of the posters! my email is sharonkpeck@hotmail.com. Just let me know how to reimburse you and I’ll email my home address. Robin I would love to get one of the posters. Just e-mail me at abaumstein@cityofmanchestertn.com and I will send you the money. LOL to Zenny, Z12, and Tasty. Has anyone heard any news on Tasty? Wakey Wakey people!!! New post under NEWS!!!! Well, that was a flop!!! Was going to add my thanks to everyone for your descriptions and comments on the Shower… and send my heartfelt condolences to Shari and her class for young Trey… but I ran smack into the website 1) being so overloaded with this message and all the responses and 2) the turnover to the new News item. So—- I’ll see you all over there. DON’T FORGET EVERYONE–today is the day Marlene needs the money to rescue the horses from slaughter!!! Hope we can help her to go “over the top” and make it so she can save all seven!! Don’t have the link but you can find her under Valley View Equine Rescue on the internet and there is a place you can click to make a donation. Maybe it would be nice to make a donation in sweet Trey’s name,he loved horses so! Bet he would love to have some saved in his name. @ Shari V.-It must have been so difficult at school today,trying to help everyone when you are grieving yourself!! I am so very sorry for his loss–what a terrible thing!! RIP sweet boy. I notice this site is now getting slow,because there are so many postings—maybe Tasty will foal tonight–then we’ll have a new page and all will work again!! Our prayers are with you sweet girl—be safe and happy!! I just happened to go to breeders cup website to look for merchandise that another poster mentioned and they have BC 2011 Queen Z stuff on sale! Here is link for anyone that is interested. Oops! I meant BC 2010.